Malaria, a mosquito-borne disease caused by a parasite, is still incredibly deadly. In the past 15 years, the rate of malaria deaths has dropped 57%, according to a Bill and Melinda Gates-backed study published Monday in the New England Journal of Medicine . In 2000, malaria was responsible for more than a million deaths. By 2015, that number dropped to 631,000. "With almost 500,000 children still dying of malaria every year, we obviously have a long way to go," Bill Gates said in a blog post . "But cutting the death rate by more than half is a miracle. 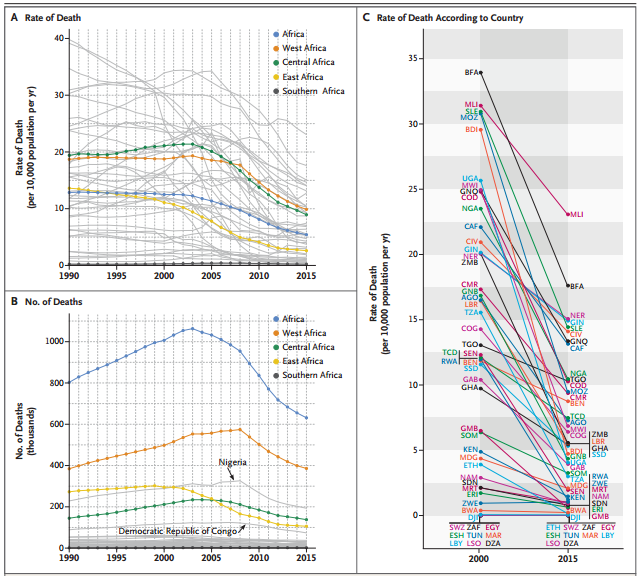 It’s one of the greatest success stories in the history of global health." Malaria is responsible for more than half of mosquito-related deaths, predominantly in sub-Saharan Africa, and 3.2 billion people still live in areas that put them at risk for contracting malaria. Since the 1950s, there have been global efforts to eliminate the disease. But, as an April report from the World Health Organization pointed out , the biggest of those barriers is dealing with insecticide resistance. Right now, the mosquito-borne disease is largely prevented using insecticides that are sprayed and used in netting, as well as antimalarial medications (there is no malaria vaccine, though one is in the works, Gates notes ). One tool, Gates thinks, could be gene-editing technology that wipes out mosquitoes — in this case the Anopheles gambiae. Essentially, the goal is to introduce gene edits that leads females to produce sterile males who then can't go on to produce more offspring. "While I’m excited about the potential of this technology, I know that changing the mosquito genome in a permanent way is something that should be done only with incredible caution and care. My hope is that it will be possible to deploy some version of this technique in a safe manner within 10-12 years."